Chorncendantra — the current phase of the cosmic game originating on the artificial planetary system; the game is played by two arbitrarily determined teams across many planets. Chorncendantra is the universal systemmechanism. It is the human game. You may non-accidentally recruit yourself by picking up a copy here. A rivetingly strange novel in which Cisco mixes game theory, serious philosophy, SF, and dark fantasy into something at once unreal and really entrancing. Kind of like what might happen if Wyndham Lewis decided to write like M. John Harrison and had Martin Heidegger as his editor. Below, you will find details on how to enter the Member prize draw, to win a copy of the book specially inscribed by the author. Before that, some general news. November 2012’s Chômu release, Crandolin, by Anna Tambour, has been shortlisted in the Novel category of the World Fantasy Awards. Read a sample of the novel at this link. If you are attending the World Fantasy Convention this year, please look out for us in the dealers’ room, as we expect to be there. The Cutest Girl in Class, a collaboration by Chômu authors Justin Isis, Brendan Connell and Quentin S. Crisp, details of which can be found in the post at this link, is now at the printers and set for a November release. It is still, of course, available for pre-order by writing to evans_lichamleas[at]yahoo[dot]com, though please note that health problems at Snuggly Books might cause delayed responses to e-mails. Finally, if you enjoyed the Chômu Radio Archive interview with John Elliott, then you may enjoy Joe Campbell and Quentin S. Crisp’s audio diary of their Hythe Adventure. And now for the details, as promised above, of this month’s prize draw. For the October prize draw we are, of course, giving away a uniquely inscribed copy of Member. For anyone unfamiliar with them, here are the oft-repeated rules : To be entered for this draw, please sign up here to our mailing list (or using the ‘Free updates’ widget on our home page) and send an e-mail with the subject heading ‘The game is called “Find Your Adversary”’ to info at chomupress dot com. If you are already on our mailing list, of course there is no need to sign up again – simply send an e-mail with the ‘The game is called “Find Your Adversary”’ subject heading to the address mentioned. Only one entry allowed per person. Deadline for draw, the 31st of October, 2013. Below you will find the results of the prize draw for P.F. Jeffery’s Jane, but before that let us announce two exciting Chômu-related events. The first of these is the launch, on the 4th of July, and at the Review Bookshop, Peckham, of a whole flotilla of books. Just to mix metaphors hopelessly, the flag-train of this particular flotilla is Eibonvale Press’s Rustblind and Silverbright, an anthology of tales related to trains and travel by rail. The other books to be launched at this event will be the aforementioned Jane, by P.F. Jeffery, Stardust by Nina Allan, Defeated Dogs, the latest collection of short fiction by Quentin S. Crisp, and Helen’s Story, by Rosanne Rabinowitz. The event will begin at 7.00 p.m., and there will be readings and wine. Letter concerning matters such as the video for t.A.T.u. 's 'All the Things She Said'. …a lunatic three-headed dragon, equal parts rollicking caper, ribald farce and embittered love story. Fraught with double crosses and missing mannequins, this is Waiting for Godot meets Beach Blanket Bingo, the two of them falling in love and getting married in a church where the priest is John Waters. Quentin S. Crisp needs to go to Japan. In order to facilitate this (finance it), he has joined forces with Justin Isis and Brendan Connell and together they have written a novel titled The Cutest Girl in Class. The book is slated to be published in Fall, 2013, in a limited edition of 150 hardbound copies. Though the exact page count has yet to be determined, the novel is approximately 75,000 words in length. A few details have yet to be determined, such as the exact paper, whether copies will be signed and/or numbered, etc. but expect the book to be of a high quality. One such detail that has now been confirmed is the inclusion of a free personalised purikura sticker for any who pre-order before August, the sticker to be stuck in the book or elsewhere at the discretion of the buyer (a digital file of the sticker image will also be included). (Please include the form of your name to be used in the sticker when you e-mail.) 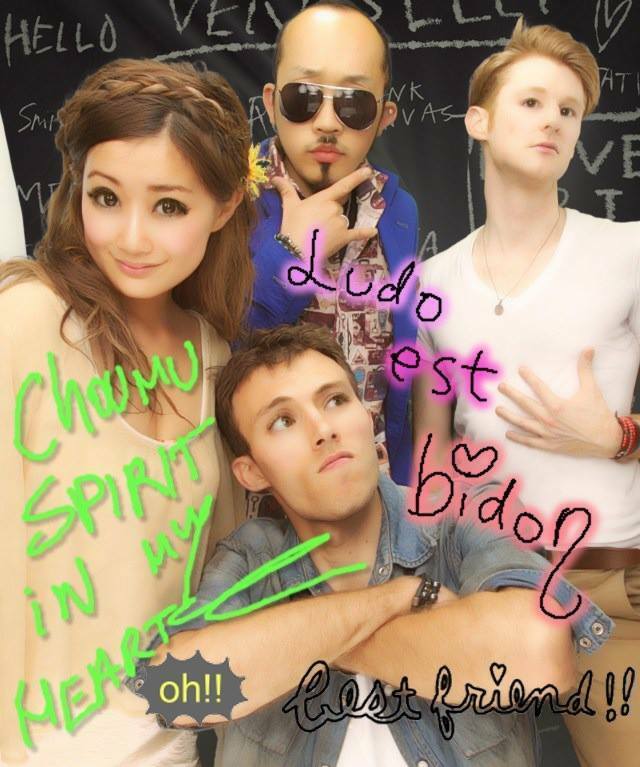 Those of you who follow Chômu’s Facebook page will probably already have an idea of what these purikura are. For a sample of what your personalised purikura could look like, please click on this link (courtesy of CHOMU Style Photoblog). As the Snuggly Books website requests, please address all questions regarding pre-orders to: evans_lichamleas[at]yahoo[dot]com. And finally we come to the Jane prize draw results. A signed copy of Jane, together with such extras as a printout from an earlier draft, a page from the novel Odalisque (now to be cannibalised for the Warriors of Love series), and some correspondence to legendary weirdmonger D.F. Lewis, concerning Russian pop duo t.A.T.u and other matters, has now been sent to Jeremy Bartels in Germany. Remember, for subscribers to our e-mail list, the next e-mail interview will be with P.F. Jeffery. The goddess smiles upon us today and allows us to release Jane, by P.F. Jeffery, the first in a projected twelve novels in the Warriors of Love series. We are also most blessed in the wraparound art from Nimit Malavia, which forms Jane’s magnificent cover. As a standalone coming-of-age tale in a future world of Sapphic romance, or as the first unrolling of a panoramic tapestry of picturesque intrigue, adventure and frolic, Jane is a lyrical and a rollicking read with a plenitude of fine and life-affirming detail. Details of the prize draw are below, but for those who don’t want to take a chance, you may embark immediately upon the journey of discovery by picking up a copy here. …a bombardment of incidents and names, evocatively conveyed through passages of honed prose and dialogue. After a tearful farewell to Modesty, I could actually sense with many senses the sea trip, the sea battle, the sea-sickness, the subsequent ceremony. I wallowed in the emerging Imperial politics, the description of the Empress who takes more than just a simple fancy to our fiscal inspector heroine. A breathless adventure, full of the gentle poetry of place and time, it manages somehow to combine pagan fertility comedy with Sapphic science fiction. Not a combination you come across every day. And now for the promised details of this month’s prize draw. For the May prize draw we are, of course, giving away a uniquely inscribed copy of Jane. For anyone unfamiliar with them, here are the oft-repeated rules : To be entered for this draw, please sign up here to our mailing list (or using the ‘Free updates’ widget on our home page) and send an e-mail with the subject heading ‘The Surrey girls came marching in’ to info at chomupress dot com. If you are already on our mailing list, of course there is no need to sign up again – simply send an e-mail with the ‘The Surrey girls came marching in’ subject heading to the address mentioned. Only one entry allowed per person. Deadline for draw, the 31st of May, 2013. Those on our mailing list can also expect exclusive interviews from Chômu authors. The next interview is to be with P.F. Jeffery. Now we bring our 2012 schedule to a close with the compendious tour of culinary history and legend, Lives of Notorious Cooks, by Brendan Connell. In Metrophilias, published in 2010, Connell set about laying before the reader thirty-six tales of sexual obsession in thirty-six cities around the world. In Lives of Notorious Cooks he pulls off another such stupendous feat, this time with cuisine, presenting fifty-one fictional biographies of great and notorious cooks (some of them saints, some of them crooks) from pre-history to the last days of the First World War. Informative, sly, uproarious, Lives of Notorious Cooks is a peek behind the scenes of the kitchens of history and a claret call to season the day! Book a table at the banquet by picking up a book here. Avid foodies may exploit Connell’s fantasies as entertainment to regale fellow diners following an especially boozy repast. Historical fantasy at its best. A dessert to take to a party: loaded with chocolate edifices, secret-recipe kimchis, ortolans, the never before sighted ‘paradise in Illinois’ and a host of other surprises—this is the pièce de résistance of information and misinformation. To be scattered as clusterbonbons or consumed at your risk, in bed. Each story is packed with wit and a quite dangerous amount of erudition. I would be willing to eat a serve of Maincave’s ‘cosmic breasts’ (order by the pair) if Le Cubisme Culinaire isn’t cited authoritatively in some future tome. We are also pleased to announce, limited to one hundred copies, the availability of a signed edition (the standard edition but with one hundred signed and numbered bookplates). This signed edition is available from Ziesing Books, Cold Tonnage, Fantastic Literature, and Jeff ‘n’ Joys. Other outlets may be announced later. For further information, please enquire by e-mail at info at chomupress dot com. The prize this month is a uniquely inscribed copy of Lives of Notorious Cooks. Here are the rules for anyone unfamiliar with them: To be entered for this draw, please sign up here to our mailing list (or using the ‘Free updates’ widget on our home page) and send an e-mail with the subject heading ‘No.1 Thick Soup in the Universe’ to info at chomupress dot com. If you are already on our mailing list, of course there is no need to sign up again – simply send an e-mail with the ‘No.1 Thick Soup in the Universe’ subject heading to the address mentioned. Only one entry allowed per person. Deadline for draw, the 4th of January, 2013. Those on our mailing list can also expect exclusive interviews from Chômu authors. The next interview will be with Anna Tambour, author of Crandolin. Today we are happy to announce the release of our twentieth title, Crandolin, by Anna Tambour, a book which very much deserves the distinction. Set in Literaturnaya typeface, with a matte laminate jacket and back and front cover art from Christopher Conn Askew, Crandolin is a dizzyingly tall tale of mediaeval cookbooks, heraldic beasts, time anomalies, railways, secret recipes for helva and moustaches, music, food, maidens in towers, science, superstition… and a donkey. Please purchase your one-way ticket on the Crandolin Express here. Epicurean fantasy at its finest. Crandolin is an uncanny mating of passion and precision: that Anna Tambour is billed as ‘author’ and not ‘magician’ belies the virtuosity with which she coaxes a whirlwind of gluttonous carnality into her scintillatingly intricate narrative web. For gourmands literary and culinary, Tambour is always a treat, and Crandolin is Tambour at her best. Bold and subtle, rich and delicate, this is fiction to savour, fiction to sustain the soul. The prize this month is a uniquely inscribed copy of Crandolin. Here are the rules for anyone unfamiliar with them: To be entered for this draw, please sign up here to our mailing list (or using the ‘Free updates’ widget on our home page) and send an e-mail with the subject heading ‘borscht borscht borscht’ to info at chomupress dot com. If you are already on our mailing list, of course there is no need to sign up again – simply send an e-mail with the ‘borscht borscht borscht’ subject heading to the address mentioned. Only one entry allowed per person. Deadline for draw, the 30th of November.